Captain Pike and his crew may have got some swanky new threads, but they almost weren’t quite as accurate to Trek lore as they’re meant to be. The only thing that we didn’t actually think about was rank at the time, because in [Discovery], the rank was done with pips on the badges. So, when we first shot the first few days of Enterprise uniforms, we forgot to put rank on. I forgot who told us, I think it was marketing, actually, saw that we hadn’t any indication of rank on our uniform — so me and my team, we spent like a night of trying to figure out how we were going to add rank bars on their uniforms. Now, it’s an honest mistake—especially considering that for the rest of Discovery the costume team doesn’t have to think about adding ranks into the costumes they create, as the Discovery crew uniform signifies rank on the combadge, rather than anywhere else on the costume. And as the “Constitution-Class” uniforms were pretty much a merging of the materials and style used in those uniforms with the classic colors of the original Trek, no one considered the rank insignia until it was too late. So that was an interesting journey, and it all happened during one night, so we had to figure that out… Then they had to go back and CGI all the stripes on the days that we didn’t do it. 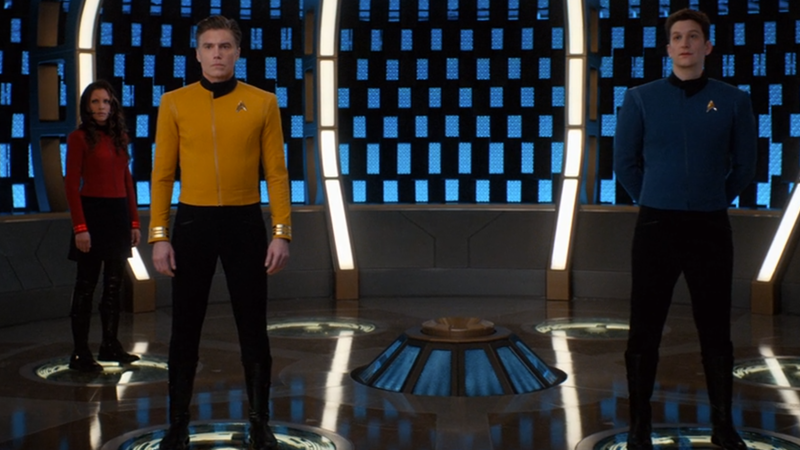 Now if you ever rewatch the premiere, you’ll have a good squint at Pike, Connolly, and Nham’s wrists and see if you can tell the difference between the fixed uniforms and the CG-enhanced ones!